All prices include anaesthetic and titanium body jewellery in the colour of your choice. Body Piercing Jewellery available for purchase at all Salons. We are fully qualified, experienced for over 12 years in body piercing and are fully licensed for piercing by Highland Council. We also comply to all standards that apply to the licence including special sterilising equipment and First Aid Certificate. Licencees are Liz, Maxine and Janine. All our certification is displayed. Note: Under 16's must be accompanied by an adult or have with them a consent form which has been completed by their parent/guardian. Please note: We accept payments through PayPal for Gift Vouchers online but DO NOT accept card payments in any of our salons so please have cash or cheque with you for payment. Thank you. 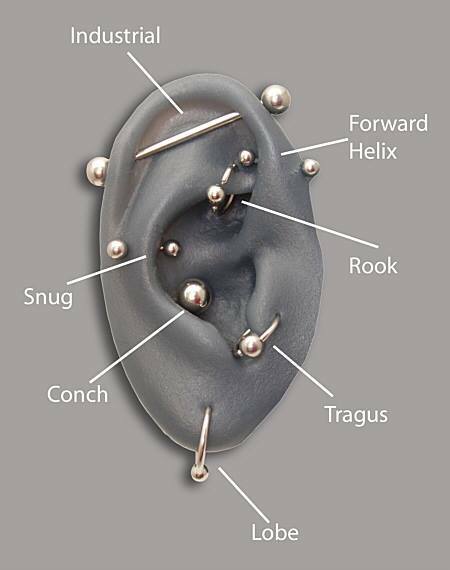 By law Body Piercings should be carried out by fully qualified and licensed staff. The fresh piercing can only accept a Titanium item of jewellery into it, in line with EU Regulations. Also noses and upper ears must now be pierced by the needle body piercing method - it is illegal to pierce with any gun method. The gun method shoots through a gold plated stud and engages the butterfly clip on the back to pull it through. The excess tissue which is made up of cartilage, bone and hard tissue can build up around the piercing site, it can cause the whole ear to collapse or at the very least be painful for some time and take a long time if ever to heal. However, when piercing with the body piercing method, via a needle, the needle is hollow and takes out of the area with it any excess tissue which leaves a clear tunnel for the jewellery to enter. As we are a registered beauty salon we use liquid or gel anaesthetic for all piercings, so the client feels very little at all. The purpose of cleaning a healing piercing is to remove any dead cells and discharge excreted by your body, as well as any external dirt and bacteria picked up during the day. You are not treating the wound with medicine or making it heal, but rather keeping the area clean while your body is healing itself. Basic hygiene and common sense, with particular attention to the specific area, are all that are required. You will be the best judge of what works for you. Pay attention to your body. It will tell you if you are doing something wrong. 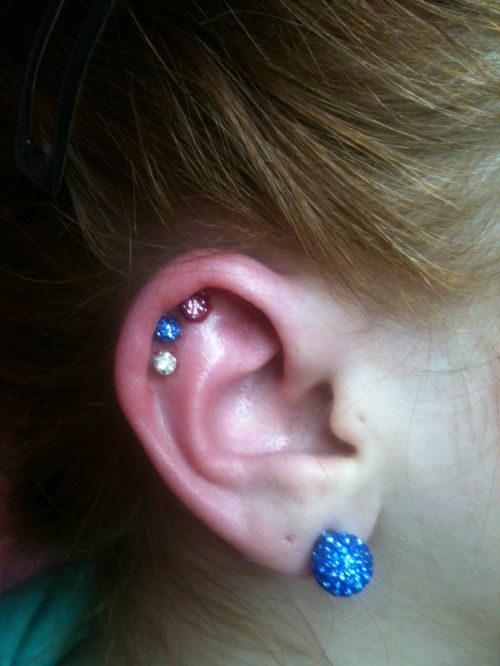 New piercings should be cleaned once or twice daily, depending on your skin sensitivity, activities and environment. Continue cleaning every day for entire healing period. Bear in mind that over-cleaning or using too many products can also irritate your piercing. You wouldn’t wash your hands three times in a row with different kinds of soap, so why do it to your piercing? Oral piercings (tongue, lip, cheek, beauty mark) heal very quickly and easily, usually within four to eight weeks. Jewelry can be changed after healing, but should never be left out even for short periods of time. These piercings close very quickly without jewelry, sometimes within a few minutes. This is especially true of tongue piercings. If you like your piercing, keep jewelry in it. If you must hide it, ask your piercer about clear acrylic or tongue colored retainers and balls. Check threaded jewelry periodically to make sure balls and discs are screwed on securely. Expect your new piercing to be rather swollen for at least several days, with residual swelling for a month or so. Sucking on crushed ice constantly for the first few days helps keep swelling down and soothes your mouth. Anti-inflammatories (ibuprofen/Advil/Motrin) will also help. Keep your head elevated for a few days (extra pillows when sleeping), and try not to talk too much. Avoid anything which thins your blood (aspirin, alcohol, stimulants, acetominophin/Tylenol) or makes your heart pound. Also avoid straws and water pipes, as the suction may cause bleeding and more swelling. Eat whatever is comfortable, though anything spicy, acidic or hot in temperature may increase discomfort in the first week or so. In the first few days chamomile tea may also help keep swelling down and soothe pain. Let it cool or chill it, and hold it in your mouth while drinking it. To allow for swelling, the initial post or ring is larger than the jewelry which can ultimately be worn. Once the swelling is gone and the piercing is healed, a shorter post or smaller diameter ring can be used. Leaving larger jewelry in is very often the cause of chipped teeth, irritated gums, scarring and other oral damage. But be patient! Changing the jewelry too soon can result in more swelling and delayed healing. Wait until you are healed. You will need to clean the inside of your mouth every time you eat, drink or smoke. The only exception is bottled water. Rinse for 30-60 seconds with warm salt water or non-alcohol antimicrobial/antibacterial mouthwash diluted according to package instructions. This will not only clean your mouth, but will soothe mouth pain and speed healing. It also minimizes the white discharge which normally forms around the hole, and helps eliminate residue from smoking. Add a pinch (1/4 teaspoon) sea salt to 1 cup (8 oz.) warm water. Use bottled or distilled water, not tap water. (If you have high blood pressure or heart problems, you may need to limit the frequency of salt water use and use plain warm water rinses. Ask your doctor). If you do choose to use mouthwash, stay away from alcohol based products such as Listerine and similar store brands. These are far too harsh, and repeated use will usually slow down healing. Instead, use a non-alcohol antimicrobial/antibacterial mouthwash diluted according to manufacturer's instructions. Tech 2000 and Biotene are two good options. Jason Healthy Mouth tea tree oil mouthwash is an excellent, cruelty free alternative which can also soothe swelling. Do not use any mouthwash product more than 4-5 times a day. Collagen Lumps - sometimes a small lump will form at the edge of your piercing, this is jusr your skin trying to heal itself. It could take several months to disappear, just keep it clean. Thanks enjoy your piercing afterwards. We have been doing this for over 20 years so are very experienced.